Your digestive system consists of a complex network of organs that work together to break food down into usable nutrients, which then disperse throughout your body. Garlic is a food with significant health benefits, but even healthy foods like garlic can cause digestive disturbance. 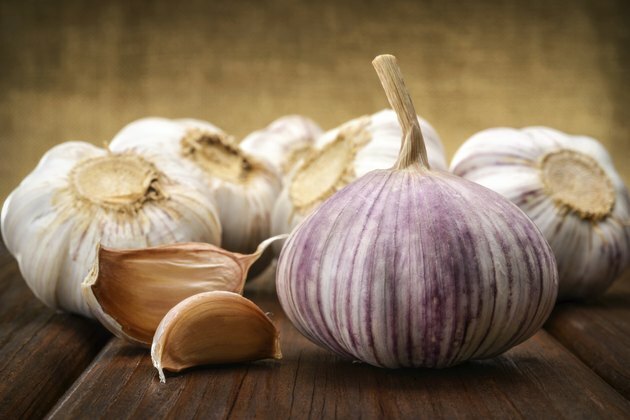 Allium sativum L., the scientific name for garlic, contains the organosulfur compounds gamma-glutamylcysteine and cysteine sulfoxides, which are amino acid precursor chemicals. Amino acids play a variety of roles in your body, including the creation of enzymes important for digestion. The natural sulfur compounds in garlic give it a pungent aroma and taste but also confer antioxidant, antibacterial, anti-inflammatory and immune-boosting properties. The form of garlic that you eat dictates its potency in the digestive process. Intact garlic that has not been cooked, chopped or crushed contains the amino acid derivative called alliin. When you crush or chop fresh garlic, the alliin comes into contact with alliinase to form the compound allicin. Allicin gives garlic its aroma, flavor and healing properties. After you swallow garlic, digestive juices in the stomach begin to dissolve these compounds, and then the partially digested garlic moves to the small intestine for further breakdown. From the small intestine, metabolized garlic compounds get absorbed into the different cells of your body including those of your liver, kidneys, plasma and muscles. Eating fresh garlic often comes with consequence of digestive upset from heartburn, indigestion or gas. The active compounds of garlic may irritate your digestive tract resulting in a burning sensation in your upper abdomen or chest. The sulfur may also mix with bacteria in the colon to form noxious gas. In the event of digestive irritation or gas from raw garlic, you can cook it, but this significantly reduces healing compounds. If you want both the flavor and healing properties of garlic, the most effective preparation is using raw, chopped cloves with minimal cooking. Powdered garlic found in the spice isle of your local market may have active compounds, but this varies depending on manufacturer. To gain healing effects of garlic, supplemental preparations with enteric coating including capsules or tablets may reduce digestive upset. Consult your physician before trying garlic supplements.